One Year Later - How Have My Finances Changed? Yesterday's Thursday Talkback question was whether your finances were worse, better or about the same as this time last year. One of my readers, Kara, asked me the same question. I knew that my finances had improved over the last year but I had not sat down and actually looked at the numbers in detail. I pulled out the records for April 2007 and compared the numbers with April 2008 and here's what happened. The numbers have been rounded off for clarity. Doing this exercise was surprising to say the least. I was a little upset that my Assets didn't break the 1% mark but I was ecstatic to realize that realize my Net Worth had increased over 50%. I was also happy to see that my non-mortgage debt decreased by almost a third. I think part of the reason I did not have a bigger increase in the assets category was due to losses in my retirement and brokerage accounts. Considering some of the financial pains some people are going through, I certainly cannot complain. What have I done to improve my finances? Used a budget to manage my outflows and spent less than I earned. I paid off my lingering credit card debt. I no longer pay any credit card interest because I only charge what I can afford to pay in full when the bill comes. I saved as much money as I could. I planned for Emergencies by saving money in a separate account. I planned for irregular expenses by adding up the total amount and dividing by 12. I then saved that money each month in a separate account. I can't wait to do this again next year to see how things have changed. If you haven't done so already, please consider subscribing to SingleGuyMoney. ING Direct - $25 Savings Referral. Open with at least $250 to get the bonus. Revolution Money Exchange - Free $25 bonus in less than 5 minutes. Like Paypal but without the fees. It's amazing what a budget can do! Congrats on increasing your net worth by over 50% --- extremely impressive. Budgeting has many positive effects, not to mention a great way of actually getting ahead. But one of the other things being able to budget will do is allow you to get ahead at work, or ahead in life. You will always have money and a plan - things employers and financiers love! 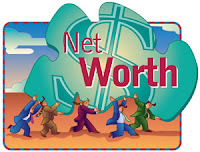 I'm looking for bloggers that have published a negative net worth. Do you know of any? Make Love, Not Debt is the only one that I know of. Most people don't start publishing their net worth until it is above zero. Great effort, and nice to see someone sticking to a plan, keep at it. I'm trying to learn how to save and starting to get it. Kudos to you for building your net worth 50 percent. I hope you do it again next year.